With preparations underway for the first Premier League in 1992, Ribero announced their arrival as a top-flight kit manufacturer in an eye-catching fashion. The company had taken the Coventry City and Norwich City contracts from Asics and they used the same style for both clubs’ home kits. However, while the white flecked design blended somewhat against the sky-blue base of the Coventry shirts, it was rendered in green and white on the Canaries’ shirts and so couldn’t be ignored. With Asics having also been Norwich’s sponsors, it was all change as Norwich and Peterborough Building Society was now promoted on the front of the shirts, with the deep blue of their logo and the Ribero in black adding to the mish-mash. Norwich had finished 18th of 22 teams in Division 1, just three points off relegation, little was expected from them and they were given a tough opening-day assignment, away to title favourites Arsenal. It all looked to be going to plan when the Gunners went 2-0 ahead in the first half, but a second-period turnaround saw Norwich win 4-2 with new signing Mark Robins instrumental. That set the tone for an exciting season. They were top at the end of September and a 7-1 loss at Blackburn looked set to signal the end of their good run but they bounced back and were eight points clear at the summit in December. Eventually they fell away in the spring but still finished third behind Manchester United and Aston Villa, albeit with a goal difference of minus-four. Incidentally, they didn’t have to wear their away shirt in the league at all that season – it wasn’t until we got Merlin’s 1994 sticker album that we even found out what it was. That third-placed finish qualified them for the Uefa Cup, and after a win over Vitesse Arnhem in the first round, they qualified to meet Bayern Munich. A stunning Jeremy Goss volley at the Olympiastadion helped them to earn a 2-1 win – he had done similar against Leeds earlier in the campaign – and they drew 1-1 back at Carrow Road. They would exit in the next round against Inter, and while they couldn’t repeat their third-place heroics in 1993-94, they were still comfortable in 12th place – ironically, their goals record was the exact opposite of 1992-93, scoring 65 and conceding 61. One kit change during the season came in January. With Ribero in financial trouble, their logo was replaced by that of Mitre, placed on a patch over the originals, with the same shirts and shorts still used. 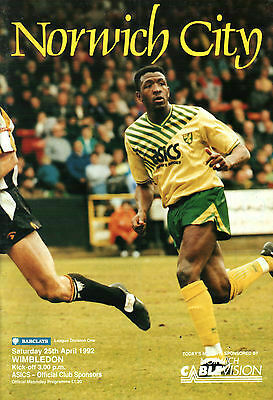 While subsequent kits in the 1990s and 2000s would be more restrained, this strip is still fondly remembered thanks to the exploits achieved and in 2016-17 Norwich wore a white, green and yellow version of the design as a third shirt, while the current home for 2018-19 references it without being a direct copy.